A major focus during the 2012 Presidential election was on the so called “education problem” in the United States of America. President Barack Obama and “governor” Mitt Romney each vowed improve the performance of American students. I agree that education is extremely important, but there is one problem; the United States of America does not have an education problem. Our schools are filled with capable and caring instructors, who enter their respective buildings on a daily basis, prepared to educate the future leaders of the free world. Often, most members of the faculty arrive to work early, and leave well after the final bell. These teachers also spend a great deal of their personal time, preparing lesson plans and grading the work of their students. Obviously, there are some exceptions. I’m not gullible; every teacher isn’t performing at the highest level. There are some instructors who barely do anything, but the majority of teachers are hardworking and caring. I understand why you would think such a thing, but let me be clear; you are wrong! I hear all the complaints about overcrowded classrooms and the lack of teaching materials, but that’s a bunch of nonsense. I’ve been in college classrooms with over a hundred students and everyone seemed to find a way to learn. I will never believe that a classroom with forty, prepared and well-behaved, students cannot learn. The American students are under-performing compared to their contemporaries around the world, but the problem is not the system. 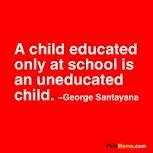 We do not have an education problem; we have a parenting problem! A teacher can only do so much. Education begins at home, prior to the students attending kindergarten, and then continues inside each household, on a daily basis, whenever students return from school. Without proper and consistent parenting, teachers will never be able to instruct their students. I would estimate that most teachers spend half of the school day fulfilling the parenting duties that each student is not receiving at home. There are too many cases of children being raised by their grandparents, because mom and dad are too immature to get their lives in order. These days, parents are more concerned with sending their child to school, wearing the latest fashion, rather than ensuring that the STUDENT is prepared to receive the day’s lesson. Children should have the ability to solve basic math problems and read at their current grade level; these are the fundamentals of education. A child should not be able to recite popular and inappropriate songs, while mimicking the overtly sexual dance moves. That’s just bad parenting and a recipe for creating a future dropout. More to the point, I know there are some parents, who think it’s cute when their child uses profanity, but a foul-mouthed child is one of the biggest parenting failures; a true tragedy. To sum up my point, It’s pretty basic; if you find that your child “ain’t lurnin’ nuttin’!” The problem is you; not the teacher! We need only look at historical figures which were disadvantaged to start with and managed to make it through the system as scientists and biologists etc. My old grandpa used to say you can lead a horse to water, but you can’t make it drink. I never buy into the excuses. I think I don’t quite understand what you consider an excuse? If you are agreeing with me I see what you mean. I’m talking about the people who blame the system; I think it’s an excuse for bad parenting. There are also examples of students who have horrible parents and are still able to become educated, but they are the extreme exceptions. Then we completely agree. Gosh as it might be, this made me think of George W. Carver. He was one of my heroes, if we can have such things in high school. That guy overcame the odds… all of them. Managing to learn as a slave is impressive indeed. No, it was not that he learned, it was that he was a scientist and despite all the reasons that he might be ignored, he was advisor to many presidents – a respected scientist, not because of his disadvantages, but because of his curiosity and reason, his science. His reason and science took him above all that could have killed him. His intellect put him where nothing else in his life could have. He overcame all the obstacles by thinking. You’re right about him overcoming all odds and rising to greatness. I agree and I disagree. I’ve been working in a school for the past 5 years and I have first hand experience of the wonderful educators you speak of but I also have first hand experience of the lazy, cynical, ill-prepared educators that are seriously doing harm to these kids. And I would say the numbers for both sides is pretty even. I one hundred percent agree that education begins at home but when you have a parent that has to work almost all day to make sure that their child is able to eat and has a warm place to stay its difficult for said parent to spend enough time educating their child- this is in no way an excuse for the parent not to take an interest in their child’s education but it does limit what the parent can do. And then there are the parents that don’t speak English, which in recent year has increased, how can they possibly read to their child? You said that when you were in college you were in a class of over a hundred, but you can’t compare college to elementary school! The level of attention a child needs (even a well-prepared and well behaved one) is way higher then a college student should ever need. In college those were called lectures, in elementary a teacher isn’t just suppose to lecture s/he needs to be more engaged with her/his students and how easy do you think that is with a ratio of 40 to 1. And not to mention when you don’t have enough materials for each student. Peter the solution isn’t just good parenting, I wish it was. There’s so much bureaucracy in the schools and don’t get me started on the unions! I think it takes a child to raise a village and that means we need all hands on deck. BTW, been a while since you had one of these thought provoking posts, not that heroes and cable tv wasn’t fascinating! I understand all the difficulties that go into teaching, but I think the main problem is parenting. Everything else can be worked through. Haha! I clearly meant it takes a village to raise a child because the other way around would get us in serious trouble! Maybe everything else can be worked through but if i was that simple I wonder why it hasnt been fixed? Ha ha! I figured it was a mistake, but part of me thought you were trying to make a new bold statement. I think the problem is unfix-able because most of today’s parents are ill-prepared to be parents.